I know Populous' work, but not the other guys. They have done a lot of big projects. I have heard of Populous and not the other firm. The stadium design should be interesting, especially since the owners want this. “We need to build a stadium that will be comfortable for both the fans and players, so it was crucial that the winning architectural design team understood the challenges and opportunities associated with the Sonoran Desert"
They want an indoor or retractable roof stadium, but they don't want to break the bank. So it might be an outdoor stadium, which hopefully it won't be. Here is some new MLS expansion news. Looks like MLS may reward Miami their franchise team on Monday? Cincinnati may have found some new land to place their stadium since the original site has some issues. Detroit has done nothing, they have the rich owners and ready to place the team in Fords Field. But MLS doesn't like the idea and prefers Detroit to build a separate stadium. Sacramento trying to find a new billionaire owner to franchise the team. Here in Phoenix, they have the land and financing to build a stadium from Goldman Sachs. 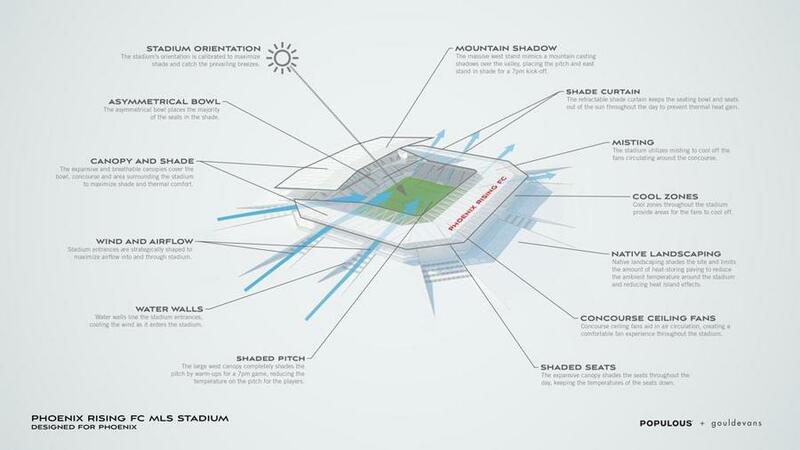 They finally decided on an architecture firm to design the stadium. The only issue MLS may have is team financing, they believe they don't have enough rich owners to finance the future team as they grow. Now I know why I never heard of Gould Evans firm. They are based out of Phoenix. Phoenix Rising FC has been busy for the past couple of months, they finally announce an architecture firm to design the stadium. They signed with MacronSports to design their kits. The kits below are their training gear. They PRFC will be announced there main kits in March. Huge news out of the Phoenix Rising FC organization. They just got some new rich owners. Phoenix Rising Football Club is honored to announce the addition of Advantage Sports Union Ltd. to its ownership group. Advantage Sports Union is a world-class sports company focused on soccer. Its Chairman is a significant investor of French Premier Ligue 1 professional soccer team OGC Nice, who qualified in 2017/2018 for participation in the Champions League. Advantage Sports Union Chairman Alex Zheng is a highly respected global entrepreneur who successfully created one of the largest hotel chains in Asia, the Plateno Group. His legacy of building 3,000 hotels in 10 years with over 300,000 rooms has set the industry standard for the global hospitality industry. The total cost of the project will total about $250 million and the stadium would be privately funded. The fans of Phoenix Rising FC created a podcast, which I haven't listen to yet. I read on twitter, they interview a couple of the owners and there some rumors that renderings of the future MLS stadium might come out this week. Hopefully, end of this year Rising can become an expansion slot. 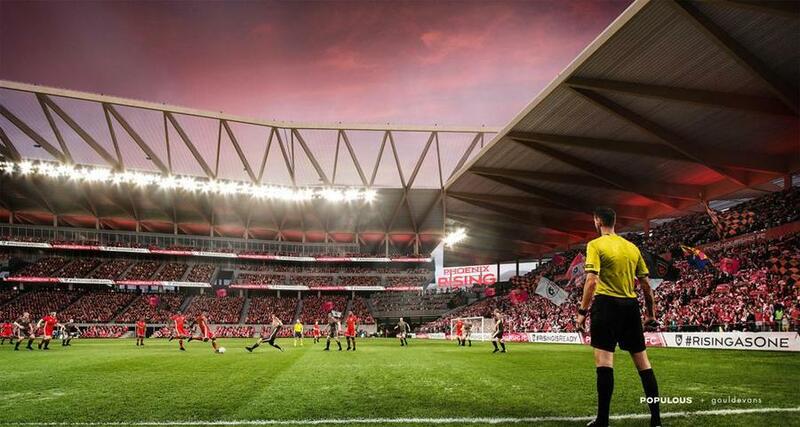 Phoenix Rising FC just revealed some renderings for a future potential MLS stadium. Here are few renderings of the stadium. I'm just following some updates on the MLS expansion and here is some of the latest info. I personally think if cities have all their stuff in line and get awarded a franchise and then decide to change the stadium location they should lose their franchise. Because there are other cities that might have better deals and won't pull this kind of stunt. Here some other information update from Cincinnati, Detroit, and Sacremento battling for the 26th spot. Cincinnati city council voted to approve a new stadium site. Simply MLS doesn't want to award a city to play in an NFL stadium anymore. Sacremento looking for some new billionaires, even though they're about to build their new stadium. Here an update from the Cincinnati group of what the new proposed stadium looks like. Since the site won't let me copy the image, click the link below. This site gives an update from the 7 other expansion sites and I didn't know that St. Louis drop out. 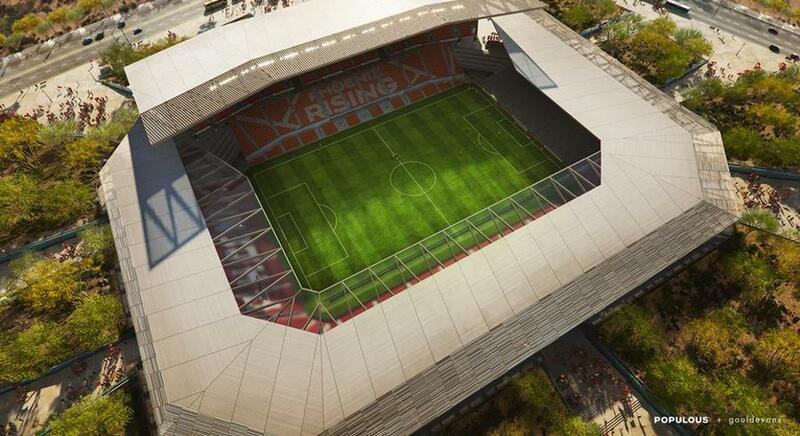 Phoenix Solid ownership group, solid stadium plan (rendering shown above), solid market. We would be utterly amazed if Phoenix didn’t land an expansion team in the next few years. San Diego Solid ownership, cloudy stadium plan, good market after defection of the NFL’s Chargers. If the SoccerCity initiative fails on a public referendum this fall, it will be hard for this group to rebound quickly. Raleigh/Durham Things have been awfully quiet on the MLS expansion front in North Carolina, as state legislators didn’t show much inclination to help North Carolina FC owner Steve Malik on his plan for a new downtown Raleigh stadium. But Raleigh/Durham would seem to be the perfect market—demographically, at least—for MLS. San Antonio On paper, the San Antonio bid is strong, with a great ownership group and support for elected officials in place. In reality, the prospect of the city landing a team is seriously threatened by Anthony Precourt’s attempt to move his Columbus Crew to Austin. No, it’s not fair, but it is the status quo. Should Precourt succeed, you can move San Antonio to the bottom of this list. Indianapolis Indy Eleven owner Ersal Ozdemir has had a great 2018, moving his team from NASL to USL and shifting the team’s home venue to Lucas Oil Stadium, where the team has drawn well in its first two matches. Will this momentum be enough to land an MLS expansion team? It will probably take some heavy hitters in the ownership group to make this happen. Tampa Bay/St. Pete Bill Edwards was seeking new investors for his Tampa Bay Rowdies (USL) earlier this year, and there was little indication a future MLS team was part of the sales pitch. Edwards has been the mover and shaker behind the shift of the Rowdies from poor-drawing team to a well-positioned USL team with its own downtown St. Petersburg home. The uncertainty surrounding the Tampa Bay Rays and Tropicana Field certainly clouds any public funding of an Al Lang Stadium expansion. Charlotte Solid ownership, cloudy stadium plan, good market. The NFL’s Charlotte Panthers have sucked all the oxygen of the local sports market, with the team for sale and a leading contender to land the team saying a new stadium is a must. Mecklenburg County is moving forward with a plan to renovate Memorial Stadium for USL soccer. With everything looking at the final 3 spots, Detroit could be skipped and Phoenix could sneak in and the final 3 cities could be Cincinnati, Sacremento, and Phoenix. But San Diego isn't far behind, but the city has to vote and approve it.